SONOSIM SUMMARY: This case report summarized the clinical course of a 37-year-old female presenting to the ED with lower abdominal pain and significant vaginal bleeding after she previously had a normal vaginal delivery and then intrauterine device (IUD) placement. 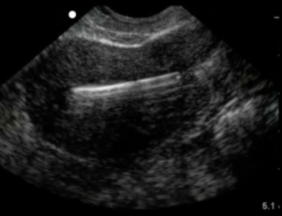 A transvaginal ultrasound did not visualize an IUD, however a foreign body was noted proximal to the right adnexa. The displaced device was removed laparoscopically without complications. A 37-year-old woman presented to the Emergency Department with lower abdominal pain and vaginal bleeding. Three weeks before presentation, she had delivered a full-term healthy infant vaginally, and 2 days before, she had an intrauterine device (IUD) placed. The patient complained of persistent lower abdominal pain and constant bleeding since the procedure. She reported the need to change a sanitary pad five to six times per day. She was afebrile with normal vital signs. A point-of-care urine test was negative for pregnancy.